Fighting between Karen soldiers and Burma Army troops broke out in Papun District last week killing one and wounding one Burma Army soldier. 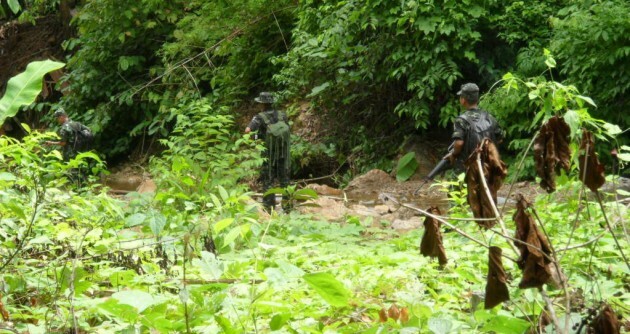 Sources from the Karen National Union’s Papun district office confirmed to Karen News that soldiers from a Karen National Liberation Army (KNLA) 5th Brigade unit clashed with a Burma Army patrol. The Burma Army troops were based at Dwe Lo Township on. The fighting took place on June 26. Eyewitnesses said the the conflict lasted 10-minutes and involved a KNLA’s unit from Company 3, Battalion 103, under its 5th Brigade command and that the Burma Army troops were from Light Infantry Battalion 8 under its Division 44 that is located in Dwe Lo Township. Sources from the KNLA claimed that the fighting broke out because Burma Army soldiers were patrolling in an area under KNU control. An official from KNU Papun District office, who asked not to be named, spoke to Karen News about the fighting. The KNU official told Karen News that the clashes had been reported to the KNU’s headquarter on June 17 and passed on to the Burma government. The official said that the government had not responded. Karen News after repeated phone calls to General Aung Lwin, Minister of Border Security Affairs in Karen State asking for the government’s response to the fighting. General Aung Lwin agreed to comment to to Karen News. Although such clashes would not derail the peace process, General Aung Lwin said that all local units need to follow an agreed code-of-conduct for the sake of emerging peace in the country. On June 13th and 14th armed clashes occurred as the Burma Army attacked the KNLA’s 4th Brigade Battalion 11 base in Huaypha. The area is under the control of the Karen National Union (KNU) in the Megui/Tavoy District. In that incident one KNLA soldier was killed one wounded. In early June 2014, the KNU’s Chairperson General Mutu Sae Po and KNLA Chief of Staff General Saw Johnny met with the Tamadaw’s [Burma military] chief of Defense Services, General Min Aung Hlaing in Naypyidaw and the Burma Army Chief-of-Staff. It was reported at the time that it was agreed at the meeting to relocate a number of Burma Army units out of Karen State. Karen sources claim that despite an agreement reached, there have been two incidents that have resulted in deaths and wounded on both sides.